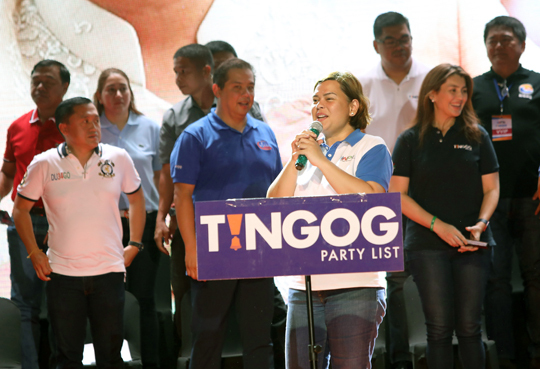 Tacloban City–Davao City Mayor Sara Duterte-Carpio on Tuesday declared that former Leyte district Rep. Ferdinand Martin Romualdez will be the next Speaker of the House of Representatives in the coming 18th Congress. The presidential daughter made the pronouncement during a campaign caravan of the Hugpong ng Pagbabago at the Tacloban Astrodome. “Our next Speaker of the House,” Duterte-Carpio said in introducing Romualdez, who is seeking a congressional comeback in the province's first district which he represented in Congress for three consecutive terms from 2007 to 2016. His wife, Leyte Rep. Yedda Marie Romualdez, is the first nominee of the Tingog party-list for the May 13 polls. For his part, Romualdez thanked the presidential daughter for her trust and confidence on him. “Salamat sa tiwala. Salamat sa oportunidad. I was humbled by the mere mention of my name,” he said.